NBR unveiled the research findings from Strategic Asia 2009–10: Economic Meltdown and Geopolitical Stability at a book launch event held at the Carnegie Endowment for International Peace in Washington, D.C., on September 23, 2009. Volume co-editor and contributing author Ashley J. Tellis and fellow contributing authors discussed the aftermath of the economic crisis and the implications for U.S. power in Asia and for the strategies of China, India, Japan, and Russia. Ashley Tellis concluded that capitalism is a resilient economic order that will not see regulation as a permanent terminus. He further argued that, while the future of U.S. leadership is secure over the short and medium term, Washington will need to address systemic imbalances in U.S. consumption versus savings rates over the long term. Roger M. Kubarych examined the origins of the financial crisis, placing a large share of the blame on several U.S financial actors. Pieter Bottelier discussed the effect of the crisis on China, concluding that Beijing has been relatively successfully at mitigating negative political and economic fallout for the country. Likewise, Sanjaya Baru argued that India has weathered the financial crisis reasonably well and will not experience a long-term decline in its economic growth. 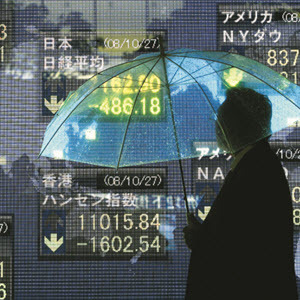 In contrast, the economies of Japan and Russia were more adversely affected. William W. Grimes observed that no industrialized country was as hard hit by the economic crisis as was Japan. Steven E. Halliwell expressed concern that the economic crisis could trigger a political crisis in Russia. The economic crisis has affected the major powers of the Asia-Pacific, although in significantly different ways. These divergent effects signal both the opportunities and challenges that lie ahead for regional stability, U.S. hegemony, and the current capitalist system.